Well, here goes my third and final post about Malaysia. Maybe soon I will be able to catch up to what I am actually doing now, in London! My bus ride from Kuala Lumpur to Penang on the Monday was not quite ideal. I had asked when buying the tickets whether it was a non-stop trip, and whether it went to Georgetown. I was assured that it was both, but it turned out to be neither. There was a stop of about 45 minutes in the middle, as well as another stop along the way to drop of some passengers. Several of the other (local) passengers were complaining to each other that the bus was driving a lot more slowly than usual, and stopped for too long. One guy was apparently missing a meeting he was supposed to be at. It eventually arrived in Bayan Lepas, and I shared a taxi with 3 others to get to Georgetown, where I was staying at the Old Penang Guesthouse. After checking in I had a bit of a look around some of the city, and had Egg Briyani for dinner at a nearby foodcourt. It is a rice dish served in a clay pot, which was nice, and well-presented. I took plenty of photos as I went along, so check out my general Penang photos and follow along if you like, along with the other albums I have linked further on. On Tuesday morning while eating breakfast I met a couple of others staying at the guesthouse – a German and an American, Ann and Annessa – who were planning to go up Penang Hill that morning. I decided to join them. Unfortunately we did not make it up Penang Hill, but we did go to see Kek Lok Si temple, which was fairly impressive. It is up a slight hill, and near the top there is a tower called the Pagoda of Ten Thousand Buddhas. We went up to nearly the top of this, where there is a balcony around the outside, and it was interesting to note that the air was noticeably cooler than at ground level, even at this slight elevation. Perhaps this was partly because there was a bit more wind. I took plenty of photos of Kek Lok Si temple, so have a look at those for more details. Afterwards we had lunch, then took the bus back to Georgetown. I had a look around the city by myself, visiting Fort Cornwallis, one of the clan jetties, various churches, temples, mosques and more. It was slightly surprising to see bananas growing on trees in the middle of a public park. The clan jetties are cool. They are long jetties, with lots houses and shops all along, built out over the sea by Chinese clans. Nearby, I saw a blacksmith at work, which was also interesting to watch. For dinner I had a different variety of satay steamboat from a hawker stand on the road near my guesthouse. At this one you cook the satay sticks in boiling water first, then dip them in your choice of sauce. Penang: signs on the clan jetty. On Wednesday I and the same two girls went to the Butterfly Farm and Tropical Fruit Farm. We had to take two buses to get there, the second of which we had to wait ages out in the heat for. They were both a bit expensive by local standards, but worth the visit I think. At the Tropical Fruit Farm we had a guided tour with a group of other visitors, followed by a fruit buffet where we could try some of the fruit grown there. Our guide did a good job, telling us all sorts of funny and informative stories along the way. The fruit buffet was nice, though we were disappointed that it did not include durian. Again, see the photos linked above for more about each. One of the owners of the Tropical Fruit Farm gave us and some other visitors a lift back part of the way to town, as the bus that goes that way only comes every couple of hours and is not very reliable. Afterwards the three of us had dinner at the Esplanade Foodcourt down by the sea, watching the lightning in the distance as we ate. There was a hawker stall near our guesthouse which sells mini pancakes, which were very nice. I tried the banana and coconut flavours; they also offered a sweetcorn flavour. I also finally tried Ais Krem Goreng (fried icecream) for dessert later in the night, which was nice and cold, but not as awesome as the name suggests. It was just a small amount of icecream wrapped in thick pastry, from a packet, briefly deep-fried. On Thursday we had a brief look around the Botanic Gardens, hoping to have another try getting up Penang Hill. On the bus we going out there we met an Indian couple who we had seen the previous day at the Tropical Fruit Farm. There were quite a few monkeys around, which expect to be fed by tourists. After a look around the Gardens I decided to try walking up a track I had seen, hoping to get to the nearby waterfall. There were a lot of steps, heading straight up the hill, and so I was sweating very heavily. There were a number of forks in the track, and I asked some locals for directions, and eventually ended up at a rest stop where there were pots of tea and water, as well and shelter and seats. I talked there to a local Malaysian-Chinese guy, who told me about his son who is busy finishing his PhD somewhere in Australia. He told me that I was about halfway up Penang Hill, and that to get to the waterfall I had to go down a different way and turn left where I could hear water. I went the way he said, and did indeed hear water in the distance, but shortly after heading that way saying that access further along the track was forbidden, so I had to turn around and head on down. I am not sure whether or not the waterfall actually was that way, but I never did see it. That said, I and my clothes were all dripping with enough sweat that it felt like I had been under a hot waterfall in a sauna. I was very glad to have a cold drink when I got back to the Botanic Gardens, and I had a shower as soon as I got back to the guesthouse. That afternoon I had a look around the museum, then had both barbecued satay and mee goreng for dinner, followed by more banana and coconut pancakes (mmm). Penang: a monkey at the Botanic Gardens. Friday was my last day in Penang, and I did not have enough time to do much. After a bit of lunch I spent an hour on the bus down to the airport at the other end of the island, checked in and eventually caught my flight back to Singapore. Penang Airport has free WiFi, which was handy. For some reason the plane circled for quite a while before landing in Singapore; quite a few passengers were wondering what was going on, but it was never explained. I had a rather hot curry for dinner, then spent one more night at the same backpackers’ as last time before heading to the airport in the morning for my flight to London. This time I slept in the other building which is part of the same hostel. They have two buildings, the main one with reception, common area and kitchen, bathrooms and bedrooms, then another building a few blocks away with just bunkrooms and bathrooms that they use when the main building is full. I finished my last post with the bus trip from Melaka to Kuala Lumpur. It was a fairly uneventful ride on the whole, but one thing I did notice and found amusing was the frequent motorbike shelters along the highway. 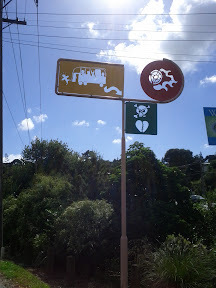 Every so often we would drive past a sign with a picture of a motorbike and an umbrella, pointing to a small track off the side of the highway, often under an overpass. After a while I came to assume that these were places where motorbike riders could stop and shelter during the tropical downpours which tend to occur fairly often in Malaysia. The rain is very heavy, but generally goes away as quickly as it started. There are a lot of motorbikes on the roads, so I guess these shelters must get a fair bit of use. I arrived in KL at a temporary bus terminal at a different place to the usual one, as the bus terminal is currently being rebuilt. A large part of my reason for going to KL was to catch up with my friends Weekian and Shirley, two Malaysians who came to Wellington to study at VUW for a few years, then went back to their home country to work and study (respectively). I actually know rather a few Malaysians, but most of them have stayed in New Zealand, so Weekian and Shirley are the only two I know who are actually in Malaysia. Anyway, after I had had some nice cold mango juice to help brave the heat, Shirley turned up to greet me and show me around. We caught the monorail into town so that I could dump some of my stuff at the guesthouse, then had a look around for a while. We had a look around the central area of the city, took some photos of nice buildings and fountains around Merdeka Square, and visited several shopping malls. Malaysia, and especially KL, has a lot of enormous shopping malls. It sounds like a lot of Malaysians spend most of their spare time at the mall, which may be partly because they have air conditioning. Have a look at my photos to get some idea of the scale, but it feels even bigger when you are actually there. One of the malls we visited — Berjaya Times Square — had a theme park complete with roller coasters and various other rides in one section. We met Weekian at KLCC for dinner in the foodcourt there, and had some good conversations catching up with each other. There is a nice little park outside with a pond and fountians where we waited for Weekian. Afterwards we had a bit of a look along Bintang Walk, which is the main nightlife area, just watching people and fountains. Weekian was busy working on Saturday, so Shirley and I went around town a bit more. We went to the Bukit Nanas forest reserve, which is a small forest area in the middle of the city, for a short walk. It was all pretty tame, and even Shirley was amused that the path was all paved with tiles. There were a bunch of schoolkids camping there and playing games. I was able to help Shirley to use her camera better, which was fun. Unfortunately on the monorail on the way back it was very crowded and I got pickpocketed. The thief took about MYR 90 that I had in my wallet, but left the NZ and Singapore coins that I also had in there, along with my ez-link card for the Singapore MRT and receipts and so on, and dumped it outside some shop. As soon as I noticed that my wallet was missing we went back to the guesthouse, who had just had a call from someone who found my wallet on the street and saw the receipt from the guesthouse. We went and picked it up from them. The whole process took rather a while, but at least it was only money that I lost. I was very worried for a while that I had also lost my money belt, but fortunately I had just left it back at the guesthouse. After finally getting that sorted out we continued on to the KL Lake Gardens. It was raining, which did have the advantage of making it a little bit cooler and probably less crowded than usual. We found more fountains to photograph, and looked around the ASEAN Sculpture Garden. Again, see my photos, I took plenty. We also went to the National Monument, just up a small hill from the Sculpture Garden, and spent some more time playing with our cameras to capture the water in different ways. In the early evening, before dinner I think it was, we went to a cultural performance which the tourism centre puts on several times a week. It featured 16 dancers, 8 male and 8 female, performing a range of traditional dances from Malaysia’s various cultures. It was well done. In one part one of the guys climbed up to the top of a pole held upright by several others, and perched up there while blowing a dart out of a long tube held in his hands. Again, I took lots of photos, so have a look at them for more details. We took more photos of fountains along Bintang Walk in the evening after dinner, and I also tried durian for the first time. I was surprised to find that it did not smell nearly as much as I had been led to believe. I was able to eat a bit but did not finish it; I was not that keen on the taste or texture. Shirley enjoys it much more. I joined Shirley at her church in the morning, a large Methodist church called DUMC. I think there were about 1500 or so people at the English-speaking service that we went to. We had a brief lunch at a nearby foodcourt with some of her friends afterwards, then met up with Weekian again to have a bit of a look around one of the universities, then Weekian drove us out to the Batu Caves. These are some big caves in a mountain, which have been turned into Hindu temples. There is an enormous statue outside, and 272 steps up to the caves. Have a look at my photos of the caves and other things around the area. There were also monkeys all over the place, climbing up and around the stairs and making a nuisance of themselves. This was the first time I had seen wild monkeys, so I did take a fair few photos of them too. There was water dripping everywhere in the caves, and a loud bell that they kept on ringing. The three of us shared some coconut water afterwards, which I did not like all that much, then headed back and decided to go to the Botanic Gardens (Taman Botani) in Putrajaya, which is a little bit out of the central area of KL. It was again helpful that Weekian has a car (thanks Weekian!). More photos were taken, of course. Apparently Shirley particularly likes reflections and leaves. Unfortunately part of the gardens was closed, but we still had enough to see in the time that we had before they closed for the evening. We had dinner together again. It was really helpful having Weekian and Shirley to explain what the various dishes were. After dinner Weekian dropped me back to the guesthouse, and we said our goodbyes hurriedly as he could not find a proper place to park. I stayed my last night at the guesthouse, then caught a bus up to Penang on the Monday. I was not all that impressed with the guesthouse where I stayed in KL. It cost twice as much as the one in Melaka (which was largely due to it being in a bigger city, but it was a bit more expensive than some in KL, so I had hoped that it would be better), did not include breakfast, and was not nearly so comfortable or welcoming. Oh, and they did not provide any top sheet for the bed. Anyway, the guesthouse in Penang was nicer. I will describe Penang soon in another post. It has been rather a while now, but finally, here is a bit about what I did in Malaysia. Melaka was my first stop in Malaysia, after crossing the border from Singapore to Johor Bahru and taking a bus up on the Wednesday. Busing between cities in Malaysia is actually quite convenient, you can just go to the bus station and buy tickets for the next bus then and there, and there seem to be buses leaving for major centres every half hour or so. My bus fare from JB to Melaka was only MYR 19 and it seemed a nice comfortable ride. Unfortunately I got a bit ripped off by a taxi driver in JB after getting a bit confused about how to get to the Larkin terminal (from which the intercity buses depart), but apart from that it was fine. Once I got to Melaka, the plan was to catch a local bus from Melaka Sentral to my guesthouse. I got myself some food and a local SIM card at Melaka Sentral, and then found and got on the local bus. It was rather old and rickety, and had no air conditioning, which made it really hot. It was bearable while we were moving and there was air blowing through the windows, but whenever we stopped at traffic lights it got really hot. The bus was also really full. Unfortunately I completely missed the stop for my guesthouse. I had been trying to keep an eye on street names in an attempt to match them up to the map I had printed from the guesthouse’s website, but nothing looked familiar. Unfortunately I had not managed to get the data connection for my phone working by this point, so I could not look up maps on that. We ended up on a highway towards Muar, by which point I realised that I must have missed the stop. The driver confirmed that I had indeed, and told me to wait for a bus on the other side of the road. (At least, I think that is what he was saying. He did not speak much English.) I duly crossed the road and waited for a bus back towards my destination, but after waiting for about an hour with only two different-looking buses passing, neither of which would stop for me, I was getting a bit worried, and it was getting on in the evening and starting to rain. I was glad that I had had something to eat before leaving Melaka Sentral. I was very grateful when a taxi stopped for me, and managed to work out where I wanted to go. I was very glad to pay the MYR 15 fare back to my guesthouse. I stayed at Old Town guesthouse, which I recommend to anyone else visiting Melaka. It is quite quiet and fairly small, but the owner is nice and friendly. It was nice having plenty of space, after the crowdedness of Singapore. They have an unusual system where there is a little notebook for each guest, where they note how many nights you are staying, and then whenever you want something that they sell (they have a various cold drinks, and some basics like toothpaste and so on) you note it in the book. You then pay for everything when you leave. There was no booking deposit or key deposit required either. Anyway, after settling in to the guesthouse, I met a Canadian girl who was also staying there (she had previously been living in Australia, I think she said), and on the recommendation of the guesthouse owner we went to the nearby Capitol Satay Celup restaurant. Apparently rather popular and somewhat famous; we had to wait for a little while before a table was available for us. It is rather expensive by local standards — we paid MYR 10.20 each for the meal — but well worth it for the experience. Each table has a bowl in a hole in the middle full of satay sauce, with a burner underneath hooked up to a gas bottle to keep it boiling. You pick your choice of satay sticks from a large selection available on the side of the room, then bring them back to your table on a tray and put a few at a time into the boiling sauce to cook for a short time (ranging from a few seconds to several minutes depending on what they are), then eat them freshing cooked. Check out someone else’s review of the place, or just have a look at my photos. On hearing that I was from New Zealand the owner of the place proudly showed me photos on the wall of some All Black who had eaten there once. After dinner we had a look at some of the nice buildings nearby in the Dutch area, all painted red, before heading back to the guesthouse. My photos of the Dutch area at night are also online. On Thursday I spent pretty much the whole day just wandering around town, visiting various museums, art galleries, ruins, churches, mosques, temples, and a shopping mall. I tried Cendol but did not like it. I also bought quite a few icecreams and glasses of cold fruit juice throughout the day. I took plenty of photos so those are probably the best description of what I saw. I had a curry for late lunch (well, it was about 5:30 pm, but I had not eaten anything since breakfast at the guesthouse that morning) from an Indian stall at a small foodcourt by the roadside. It was cheap (MYR 3.50 for the food, plus MYR 0.30 for water), and the owner, although he did not speak much English, was really friendly. He was asking me about where I was from, and talking about how NZ was in the World Cup this year, and he kept on giving me more food and water — he gave me a different sort of curry to try which he thought I might like more, then some more vegetables, and more water to drink. The Malaysians I met generally seemed more friendly than the Singaporeans, especially in the smaller cities. There were a few more people at the guesthouse that night, including an American man who had spent the last 16 years lecturing at universities in Japan, an Irish girl who lived in Scotland, and a girl from Sydney who had spent the last 2 years in London. They seemed to get along well with each other. One of them had had the same problem as me in missing the bus stop, and also ended up somewhere in the middle of nowhere just like I did. She ended up finding a store, where one of the other customers called the guesthouse for her, and the owner came and picked her up. I had duck rice for dinner that night at a restaurant next door to the guesthouse, which was nice. The restaurant also seemed a lot cleaner and generalyl nicer than some of the places that I had eaten, though they did not have menus so I just had to ask what they had. The next morning I had a quick look at the memorial and graveyard at Bukit Cina, right near my guesthouse, then caught a bus back to Melaka Sentral to find a bus to KL. The local bus was much nicer this time, in better condition and with air conditioning. See my next post for a bit about happenings in KL.